Steemitblog just announced the release of Steemit's newest feature, the "Promoted" content section. Read all of the details below. The Promoted content section isn't quite live yet but it is already displayed next to Trending and Hot sections on the navigation bar. The Promoted content section will sort articles based on which articles have received the most SBD (Steem Backed Dollars) from Steemit authors. In order to be featured in the Promoted content section, authors will need to transfer SBD to the @null account by clicking at the bottom of the post that they'd like to promote. The amount to be deposited is up to the authors, however, I'm guessing that the higher the SBD amount deposited, the more exposure a promoted post will receive. Once the SBD have been received by the @null account, the SBD will then be added to the total received by the post and increase it's ranking in the Promoted content queue. If you're wondering who will be getting the SBD from the @null account, in short, the stakeholders, which is us. The @null account is a special account that Steemit has created just for the Promoted content section, and no one has control over the account, including Steemit. Once SBD are transferred to @null, the SBD are put away for the time being. Steemit plans to eventually remove the SBD, Steem, and SP (Steem Power) held by the @null account from the supply. Removing the SBD, Steem, and SP from the @null account could be a great advantage to the community because it means that the SBD will be distributed to all stakeholders (us). Now because all payments on Steemit are made in SBD, it means that they are in fact similar to the debt of the network (Steemit), which means that all payments made to promote posts will serve to reduce the debt load on Steem which theoretically will increases the value of Steem (Hooray!). Because the promoted content is self-curated, readers should hypothetically be able to discover new authors, and authors should be able to build their followers. The more users read, upvote, and follow authors who promote their content, more users will be willing to spend SBD to promote their content as well. 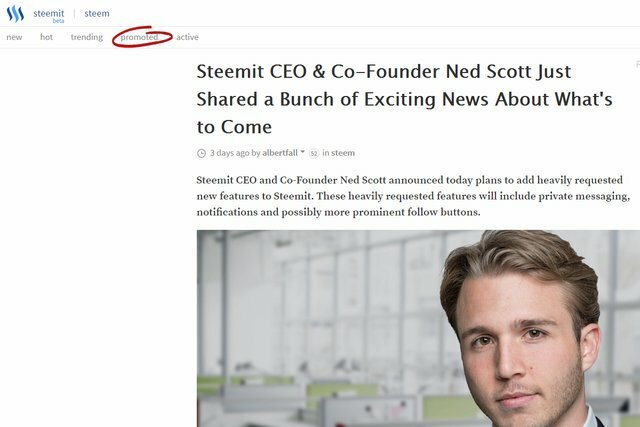 This is in fact good news as well, because the more users spend to promote their content, the more Steem should grows in value and boost capital into the platform and stakeholders (us). However, the potential good news comes with a disclaimer from Steemit. Read the full disclaimer below before pressing the "Promote" button on your post. 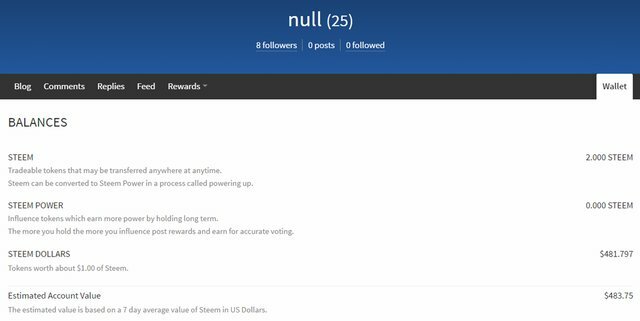 The @null account is a special blockchain level account and does not belong to Steemit, Inc or any other individual. Sending money to @null does not constitute a contract between you and anyone else. Steemit, Inc can and will change how it chooses to display, filter, and sort posts in the promoted section at its sole discretion. Now what remains to be seen is what will the quality of the promoted content be. Because after all, the promoted content will be self-curated, which means that this opens the door to all content on the network. I was just discussing something along these lines last night after @adamt made the post below. We will see how well it works out. My theory is that many minnows will not want to "pay-to-play" by "promoting", but we will see. @albertfall - please check the link below and see what you think. Just read @adamt's post, and he was ahead of the curve with his proposition of a "Power Bump" feature. 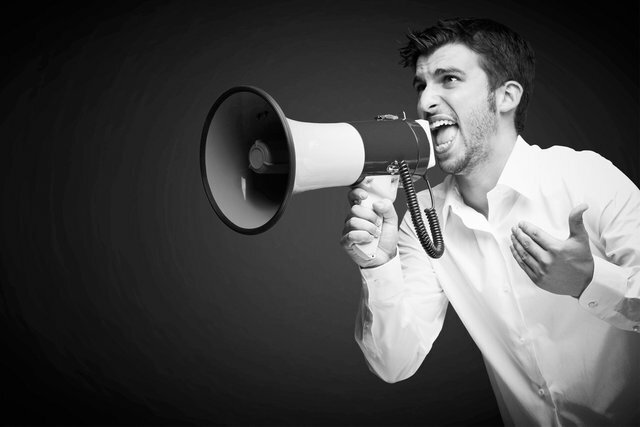 This might just help bring the spotlight to great content that has slipped through the cracks. I've personally already promoted a few posts, and I look forward to seeing how well they perform in the Promoted content section. I guess there is one major problem with the Promoted content section, and I'm not sure if Steemit already addressed it or not. The problem that I see is how will authors be able to tell if their content is doing well because it is in the Promoted section, or just simply because the content is great. A simple analytics dashboard could fix that, and it might even encourage the many minnows to promote their content as well. very good point. The more artificiality you have in a system that is trying to be authentic, the further it gets away from being authentic. Wouldn't this have been better for steemit if they had announced this before the weekend, so that we could have discussed this on here and given some genuine feedback, before they acted? Great points @paulpuk2000! And I'd have to agree with you that an announcement before launching the new Promoted section would have been great. An announcement would have also helped the community get prepared but also provide feedback to Steemit before the launch. My guess is that this new Promoted section is something that was in the pipelines for quite some time, and they rushed to deploy it. 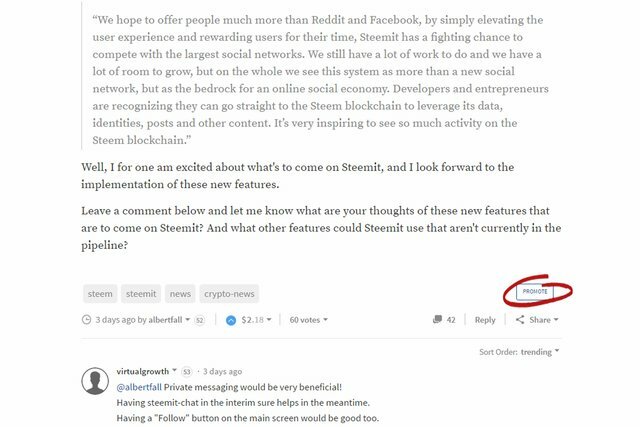 This could have been in due part to other decentralized social networks launching or updating their features, and maybe, just maybe, Steemit wanted to stay ahead of the curve and keep their users by offering the new Promoted section. This is all speculation of course, but a heads-up would have been nice. Thanks for sharing your thoughts @paulpuk2000. If only, I had been a tad earlier! But thanks for the mention @albertfall! Well this is certainly ONE huge step for Steemkind !! Yes it is @gomeravibz! But is it a good step for Steemkind? I think that's yet to be determined. Well as we are in Beta, surely its allowed to test the statement of Sir Isaac Newton " Namely that, what can go up, may also come down !! ; - ) Its good to test this sort of idea now, to see how and if indeed it works, before going public. As a member of the community that is struggling for visibility to my posts, I think this option is an interesting one. Does anybody know here how long before Steem might go public by the way ?? We will see what tonight brings! Well i think this is sort of situation is a good protection against people posting absolutely anything there. As if the user of this service is not completely sure that his post is worth promoting by this method then its possibly best not to use it as it may not be worth it after all and he will incur a loss to himself. But if the investment is made, surely this shows that this member believes in his post and finds it worthy of the investment. But i still think that the most important section for me is the New Post section as this is Steem,s own veritable " printing press " ! So i really would like to see personally this particular section being even more visible than it is right now !! I paid >$3 SBD to promote a post and it's not even showing up on the promoted tab as far as I can see. Probably won't use this feature unless I strike whale oil. Thanks for sharing your experience so far with the Promoted content section @concentrate. I've promoted a few of my posts but I haven't seen much return yet but the night is still young, so we'll see in less than 24 hours what the verdict is for me. I hope it works out. It was one of those things I had considered but couldn't figure out a good implementation of. If your boost post invest was 1.95 like other user said, now you are getting profit. I upvote your post a minute ago and now i see your earns are 2.28 and you have 20 hours more to go to the first payout. And that is one of the two payouts cause there is another payout 30 days after the post is launched to Steemit. For now you recover your 1.95 invest and have a small profit. Congratulations dude. Have a terrific tuesday of earnings.